Receiving a spine or brain tumor diagnosis can feel overwhelming, even if it’s noncancerous. Our world-class experts have specialized training and experience in treating even the most complex spine and brain tumors. You receive personalized, compassionate care with treatments that use the latest advancements for the best possible results. The Stanford Cancer Center is part of the Stanford Comprehensive Cancer Institute, one of only 45 NCI-designated comprehensive cancer centers in the country. Each member of our world-class team has specialized training in diagnosing and treating spine and brain tumors to deliver the expertise and care you need most. We lead the way in translating discoveries into the latest diagnostic and treatment options. Our research and clinical trials have opened doors to technologies and techniques that are changing and saving lives around the world. Our highly trained neurosurgeons, neuro-oncologists, neuroradiologists, radiation oncologists, neuropathologists, and medical physicists come together to surround you with expert care. They effectively treat all types of spine and brain tumors, including those that other health centers consider too challenging. Our team offers a variety of treatment options for primary brain tumors, which are tumors that begin growing in the brain. Metastatic, or secondary, brain tumors are cancer cells that have spread (metastasized) to the brain from elsewhere in the body. Learn more about metastatic brain tumors and our treatment options. Our team offers treatment options for spine tumors. These tumors begin growing in the spinal cord, the backbone, or where nerves attach to the spinal cord. We combine expertise, advanced technology, and a patient-centered approach to develop personalized treatment plans. Working closely with you, we review all treatment options together to determine the right plan for you. We bring together experts from multiple medical fields to review each case at weekly Tumor Board meetings. You receive specialized care you can trust, from a compassionate team who understands your needs. Stanford neurosurgeons invented CyberKnife in 1994. These discoveries revolutionized cancer care by reducing treatment time and treating tumors that were considered inoperable. More recently, our doctors have led the way in expanding use of CyberKnife to noncancerous tumors and other conditions. We conduct ongoing clinical research in promising areas and partner with innovative medical device manufacturers to bring the latest, life-changing technologies to you first. Stanford neurosurgeon Melanie Hayden, MD, can now use intraoperative MRI and feedback from an awake patient to make tumor resection safer and more effective. In this video, Hayden, an assistant professor of neurosurgery, explains how neurosurgeons at the Stanford Brain Tumor Center now apply this higher level of MRI imaging during surgery to immediately visualize whether enough of the tumor has been removed or if they should continue removing tumor cells. Stanford doctors are also using genetic analysis of brain tumors to make treatment decisions that are much more precise to each patient. “We’ve figured out the right patient for the right procedure and that has improved outcomes significantly,” Hayden said. She specializes in the most complex surgeries to remove brain tumors, cancerous and benign, averaging about 100 surgeries each year. In addition to her clinical practice, she also conducts research into neurological cancers. That research has produced more than 25 journal publications and won recognition from the NIH and other awards. Hayden received her seven-year training in neurosurgery at Stanford Health Care. She also has the benefit now of the new Stanford Neuroscience Health Center, where doctors and other clinicians from 21 neurological subspecialties work together in an environment designed with guidance from people with neurological disorders. The Center offers a complete range of services from diagnosis to treatment in one location. Surgery is usually the first treatment for many brain and spine tumors, both noncancerous and cancerous. For many tumors, CyberKnife radiosurgery — a noninvasive, robotic delivery system for radiation therapy — offers another initial treatment option. Our neurosurgeons are nationally recognized experts in the latest minimally invasive and advanced techniques, even for the most complex cases. We will help you determine the best treatment for your needs. We successfully treat a high volume of patients, giving us the extensive experience you need for the best care possible. We use the latest technology for treatment planning and mid-surgery monitoring to safely remove as much of the tumor as possible while avoiding critical brain structures, including those used for language, motor, and sensory function. Our neurosurgeons deliver the highest level of expertise in advanced minimally invasive and open surgical techniques to aggressively — but safely — remove tumors that begin growing in the brain. Our neurosurgeons and otolaryngologists work together to offer the latest treatments and techniques for treating tumors in the pituitary gland. We safely remove as much of the tumor as possible while protecting nearby healthy tissue. 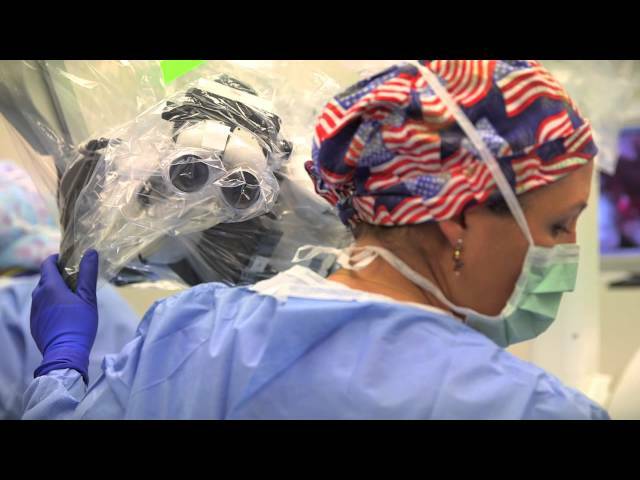 Our neurosurgeons and otolaryngologists partner to deliver the latest surgical techniques to treat acoustic neuromas, a noncancerous type of brain tumor. With your health and quality of life top of mind, we focus on preserving your hearing, balance, and facial nerve function. The CyberKnife system provides an effective alternative to traditional surgery for treating cancerous and noncancerous tumors. The system uses computerized, real-time imaging to deliver the maximum safe dose of radiation from different angles, directly to the tumor or target tissue. If you have a cancerous tumor, your care is in expert hands at Stanford. With comprehensive treatment options and leading expertise, our team of neurosurgeons, neuro-oncologists, radiation oncologists, and other specialists design the best care plan for you. If you have a slow-growing tumor, we may recommend monitoring it for signs that it may be worsening and need treatment. Your doctor works with you to determine how often and what type of testing you need. For certain tumors such as brain metastases or glioblastomas, we analyze tumor cells for specific genetic markers that might respond to targeted therapies. We review the results with Stanford’s Molecular Tumor Board to determine the right treatment options for you. CyberKnife radisurgery targets tumors with high-precision, intense radiation to shrink them or keep them from growing. 3D conformal radiation therapy (3D-CRT) uses 3D imaging to match the energy beams delivered from various angles to the exact shape of your tumor. Intensity-modulated radiation therapy works similarly to 3D-CRT but allows your doctor to adjust the radiation dose of each beam to avoid healthy tissue. If you have a family history of cancer, we offer expert genetic counseling and testing to learn more. Our services can identify gene mutations (changes) that may increase the risk of hereditary cancer. We help you and your family understand the results and guide you through important personal decisions. Family risk management is a joint partnership between our Neurogenetic Oncology Program and Cancer Genetics Program. Learn more about our cancer risk assessment with genetic testing and counseling. As a Stanford Health Care patient, you may be eligible to participate in open clinical trials. Open trials refer to studies that are currently recruiting participants or that may recruit participants in the near future. Closed trials are not currently enrolling, but similar studies may open in the future. Closed trials are not currently enrolling but may open in the future. Our center brings together Stanford experts from multiple fields of medicine who offer important perspectives on brain and spine tumor care to each person we see. We work together in our weekly Tumor Board meetings, where our team of specialists reviews more complex cases and provides recommendations for treatment. Neurosurgeons specialize in treating brain and spinal cord cancer through traditional (open) and minimally invasive surgery and CyberKnife radiosurgery, a noninvasive form of radiation therapy. Surgical oncologists perform biopsies (taking tiny tissue samples) to test for cancer. They also surgically remove tumors and surrounding tissue. Neuro-oncologists specialize in diagnosing and treating cancerous tumors of the brain and spinal cord. They treat these cancers using medications including chemotherapy, hormone therapy, and biologic therapy (targeted therapy and immunotherapy). Neuro-oncologists often serve as your main health care provider, coordinating your treatment among several specialists. Radiation oncologists specialize in using high-energy X-rays and other radiation therapy such as CyberKnife to treat cancerous and noncancerous brain and spinal cord tumors. Radiation can destroy cancer cells and prevent them from spreading, and it can destroy noncancerous tumor tissue. Using advanced technologies, radiation oncologists can precisely target tumor cells to avoid damaging nearby healthy tissue. Neuroradiologists specialize in diagnosing and treating cancerous and noncancerous brain and spinal cord tumors using diagnostic imaging. Our neuroradiologists have additional training and experience in spine and brain tumor care. These doctors interpret imaging results and take biopsies, when needed, to help confirm a diagnosis. You may not meet your radiologist, because these doctors usually work behind the scenes. Neuro-anesthesiologists specialize in using medications to block pain, help you relax, or make you unconscious for spine and brain tumor procedures. Neuro-anesthesiologists also monitor your vital functions such as breathing, blood pressure, and heart rate during surgery. Depending on the type of surgery you are having, you may need local (small area), regional (larger area), or general (overall) anesthesia. Otolaryngologists specialize in disorders of the ears, nose, and throat. Our neurosurgeons partner with otolaryngologists to treat acoustic neuroma and pituitary tumors. If necessary, your care could include consultations and treatment recommendations from these specialists. Neuroendocrinologists diagnose and treat patients with diseases of the endocrine system. Our neurosurgeons partner with neuroendocrinologists to treat pituitary tumors. Neurointensivists specialize in the care of critically ill people with brain or spinal cord conditions, requiring additional care and close monitoring usually in a neurointensive care unit. Stanford is an Academic Medical Center, which is a type of hospital setting where doctors teach medical students as they progress through medical school and training. Stanford Medicine is a partnership between Stanford University School of Medicine and Stanford Health Care. Since Stanford is a teaching hospital, you can expect to meet many providers and providers in training. Our oncology-certified health care providers work with your oncologist to help with diagnosis and treatment. APPs may recommend medications, lifestyle changes, and services such as genetic counseling. An APP can be a nurse practitioner (NP), physician’s assistant (PA), or clinical nurse specialist (CNS). Multidisciplinary care coordinators are registered nurses who provide one-on-one support throughout your care journey. They help you navigate from your first contact with us to follow-up care, assessing your needs, answering your questions, making referrals, coordinating appointments, and providing education. Neuro-oncology nurses are registered nurses with specialized training in care for people with brain and spinal cord tumors. Our care coordinators provide you with information and assistance before and during your appointment. Medical Assistants take you to your exam room after you check in for your appointments. They check your vital signs before your doctor sees you. New Patient Coordinators contact you before your first appointment and help you prepare by providing the information you need to know and bring with you. Patient Access Representatives greet you at the front desk and register you for your appointments. ITA Schedulers schedule your appointments if you have apheresis (a specific type of blood transfusion) or chemotherapy. Surgery Schedulers call you to arrange the details for meeting with a surgical oncologist or reconstruction surgeon or the surgery. CyberKnife coordinators serve as your single point of contact during treatment. CyberKnife patient coordinators work with you and your doctor to coordinate insurance authorization, determine clinical trials eligibility, and gather information before consultation. They also schedule your follow-up imaging and visit with your surgeon, and expedite appointments. Our genetic counselors have specialized experience in cancer genetics, the study of genes and gene mutations, and how they affect a person’s risk of cancer. Not everyone may benefit from genetic testing. It is designed for people whose medical history shows the possibility of an inherited gene mutation. Genetic counselors advise you and your family on identifying and managing any risk of inherited cancer. They work with you and your doctors to perform and review any genetic testing and help you understand the results. Occupational therapists are skilled practitioners who provide rehabilitation care to help you regain strength and functional ability during and after treatment for cancer. They help you with activities of daily living such as bathing, dressing, managing your medications, and driving. If you qualify for a clinical trial, our research coordinators guide you through the process. They educate you about what to expect during the study, answer your questions, and schedule your appointments. As part of your care, we design a personalized wellness plan to support your comfort before, during, and after treatment, and to help your family cope with the effects of having a loved one in cancer treatment. When you come to Stanford’s Brain and Spine Tumor Center, you can often see several providers on the same day, in the same clinic. We offer on-site imaging in each of our three locations and two CyberKnife systems. Stanford is the only health center in the Bay Area with two active CyberKnife systems, providing faster access to treatment. • Parking and directions: Use the map to find a location near you and get addresses, directions, and parking information. • Insurance and billing: Seeing doctors in the Brain and Spine Tumor Center is easy. We accept self-referrals and most insurance plans. • Coordinated care: Our multispecialty clinics allow you to see your doctors during the same visit and in one location. • MyHealth: Our MyHealth system allows you to access your records and test results from home, as well as communicate with your doctors. What insurance plans does Stanford Health Care accept? Have insurance or pre-authorization questions? The Patient Financial Clearance team is available Monday – Friday, 8 a.m. – 5 p.m., to answer your questions. Please call 650-724-4445 or 1-877-291-7335 (toll free). How do I find the right doctor for me? When choosing a doctor, it’s important to consider the doctor’s clinical training, experience and expertise in a specialized area that matches your health care needs. What support resources are available to me? Do I need a doctor referral to be seen at the Stanford Brain & Spine Tumor Center? You can call the clinic directly to schedule an appointment with one of our doctors. Call 650-723-6469 to make an appointment. For your first appointment, you should plan to bring any related test results and your medical history to share with your doctor. Our clinic receptionists will confirm the information you should bring with you prior to your first appointment. I need directions to the clinic. Where do I park? The Stanford Brain & Spine Tumor Center is located at the following address. Valet and self-parking options are available for a fee. Please plan to arrive 20-30 minutes prior to your appointment time. This will allow you plenty of time to park, locate your clinic and complete any additional paperwork. How do I send my medical record to SHC? Please print, fill out, and return the Medical Record Release Form to your new patient coordinator. The medical release form is an authorization form for external facilities to release medical records to Stanford Health Care. Can my family member or friend attend my appointment? Always feel free to bring someone with you to your appointments. A family member or friend can help ask questions, remember the information your care team gives you, and provide support. What is the best way to get all my questions answered during my appointment? Write down your questions before your appointment and rank them in order of importance, beginning with the most important ones. If there isn’t enough time to have all your questions answered during your appointment, ask your doctor who you can speak with to get your other questions answered. You have multiple options when it comes to paying your bill. You can also pay as a guest without creating a login. By calling a Customer Service Representative at 1-800-549-3720, Monday – Friday, 8 a.m. – 5 p.m.
For more information about billing, visit our Billing page. How do I cancel or reschedule my appointment? Please call our clinic receptionists at 650-723-6469. They are available Monday through Friday, 8:30 a.m. to 5:00 p.m. to help you reschedule or cancel your appointment. How do I know if a clinical trial is right for me? To determine if a clinical trial is right for you, talk to your doctor. He or she can refer you to a research coordinator for more information on studies that may be right for your specific condition. You can also find the guidelines for who can participate in a particular clinical trial online. However, it is best to work with your doctor to decide the right care approach for your needs. I live overseas. How do I access Stanford care? Many of our programs are available to international patients. Our International Medicine Services team can help you find the right doctor, estimate medical costs, book travel, and get you information about Stanford programs and services. Please call +1 650-723-8561 or email IMS@stanfordhealthcare.org to get started. Fax the patient referral form with any supporting documentation to 650-320-9443. To request an appointment with a specialist, call 650-723-6469.